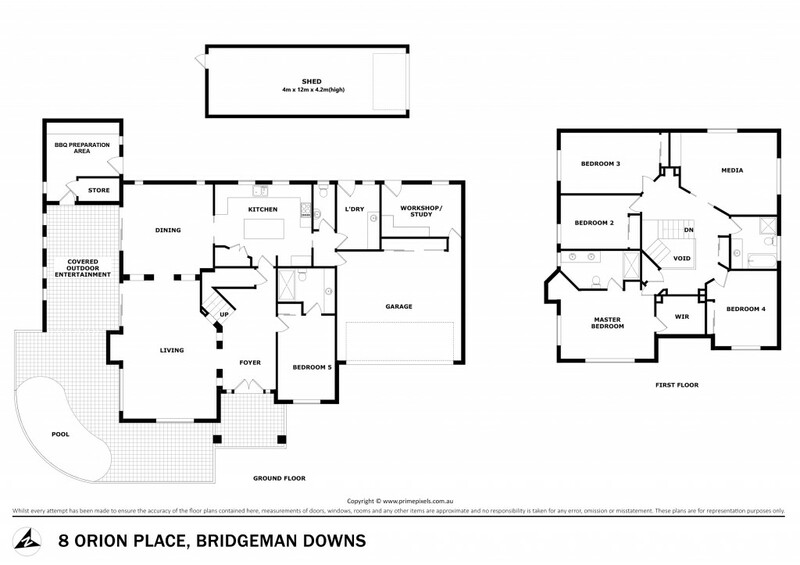 Presenting 8 Orion Place, Bridgeman Downs. Resting on a prime 1,188m2* parcel of land perched high in coveted Orion Place, number 8 presents the dream package you've been searching for. Spread over two levels, this beautiful family home offers space and style with multiple living areas. On the ground floor and at the heart of the home are lounge, dining and kitchen areas - all generously proportioned and enhanced with high ceilings, crisp clean detailing and a timeless contemporary colour scheme you will just love coming home to. Equipped with quality stainless steel European appliances, generous island bench and extensive storage space including a floor to ceiling walk-in pantry, the sleek kitchen is sure to be a delight for the chef and entertainer alike. Embracing the Queensland lifestyle and resort inspired living, the superb covered outdoor entertaining area complete with a TV, fire place and separate BBQ preparation area with wine fridge is easily accessible from both living and dining areas and is the perfect spot to entertain friends or just to relax and watch the children play in the sparkling saltwater pool. Also featuring on the ground floor is a powder room, workshop (or perfect study) and an oversized bedroom with ensuite. Venture upstairs and you will find four bedrooms and a sensational home theatre media room. The stylish master retreat is spacious and boasts luxurious plantation shutters, walk-in robe and sleek ensuite with floor to ceiling feature tiling and frameless glass shower screen. With an extensive list of features expected in a residence of this calibre and with nothing left to do except move in and enjoy, this wonderful property is a must to inspect. Living here will have you positioned in the suburb of Bridgeman Downs approximately 16 kilometres from Brisbane's CBD and moments away from a selection of parks and walking tracks, public transport, shopping and dining options.